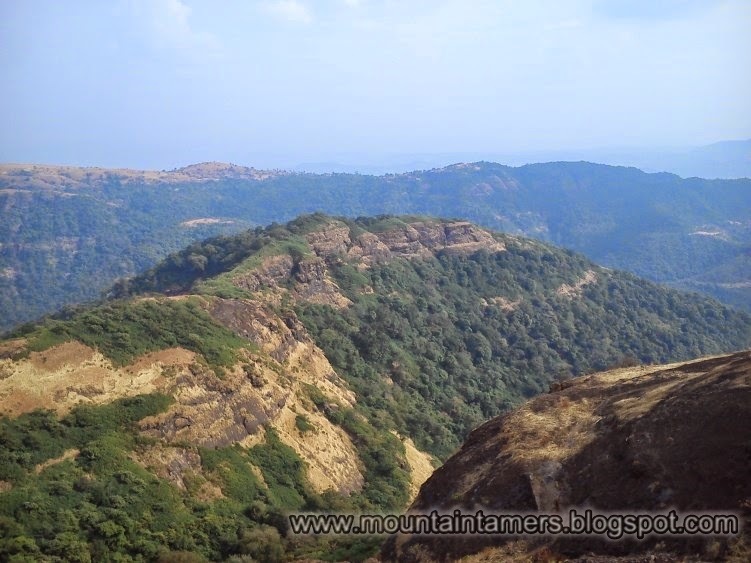 This post is just a short version of our my visit to Manikgad. 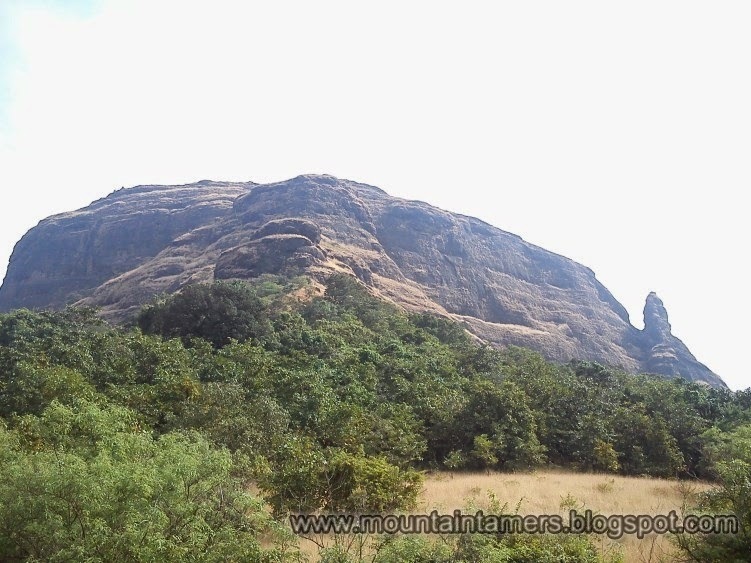 To read the official guide to Manikgad click here. To read about what to see at top of the fort, continue reading. If you like what you read then comment below and let me know. 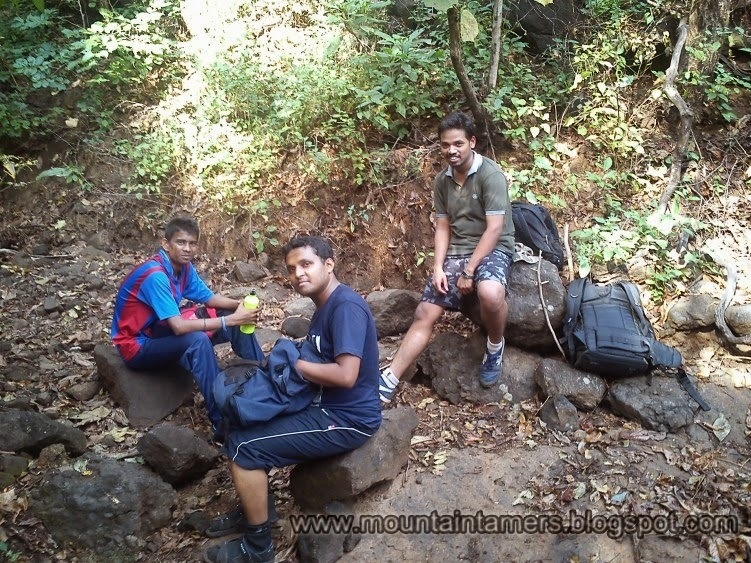 At the start we were just four of us- Aaditya Gurav, Ninad Vilankar, Vinayak Pol and me. But while returning 12 trekkers got added up as their guide betrayed them on their way back and they had to rely on us to reach the village at the base. This was the second visit with my friends and a third visit overall. The November rains, the day before, had washed the city and we were greeted with a pleasant weather, perfect for trekking. We left Panvel at 7.45 AM. From the highway we could see the silhouettes of Kalavantin-Prabalgad, Irshalgad, Matheran, Chanderi, Mahismaal, Nakhind, Karnala and many more forts far off. And within an hour we reached the Pataalganga ( पाताळगंगा ) Industrial Estate and crossed the mammoth Reliance Factory. We followed the same route as described in my previous blog. We had visited this fort earlier in the month of August 2012, and the rain clouds had completely blocked the visibility making it difficult to spot the route correctly. 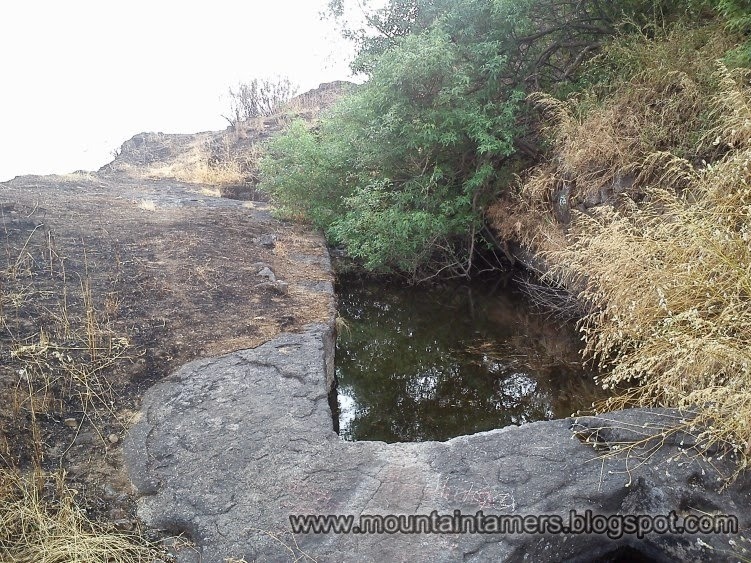 We thought that in a sunny month like November it could be easy to trek Manikgad. But the picture was different altogether. Thorny bushes and Karvy trees had made the trek- not difficult, but time consuming. 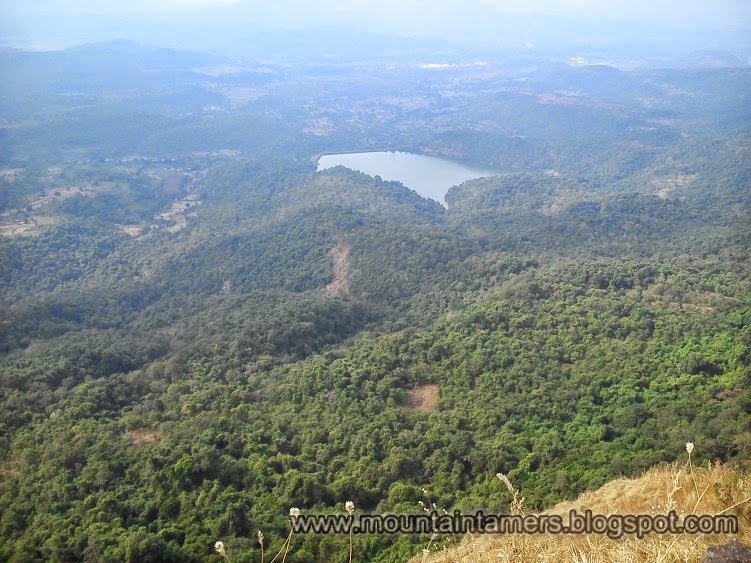 On the traverse up to the foot hills of Manikgad, theres a reservoir- Jambhivali (जम्भीवली) which can be seen below at some height. And moving for another 30 - 40 minutes from here, we come across a small shed housing a Lord Hanuman carving. Near the Lord Hanuman carving, some distance inside the forest, we also spotted a small carving of a unknown deity. Unlike last trek where we had to expedite the trek due to time constrains, we had some more time in hand this time. We had the opportunity to explore the fort. Trust me, there lots more to see than just 1 huge water tank and the main stone entrance. At the top there are about 8 to 10 water tanks, a small shed, a Shivling besides that shed, vestige of a standing structure, an almost fallen-apart wada, a set of stone-stairs, carved-out Ganesh sculpture on the main entrance, chunyacha ghana, a destroyed entrance to the fort (just besides the main entrance) and lots lots more. I had never heard anything about the existence of the bees at Manikgad. At 2.00 PM they appeared out of nowhere, just after we entered the fort (near first water tank) and buzzed past us from above our heads. Well, there wasn't any attack of any kind but that moment was scary enough. To read the detailed description of the route click here. 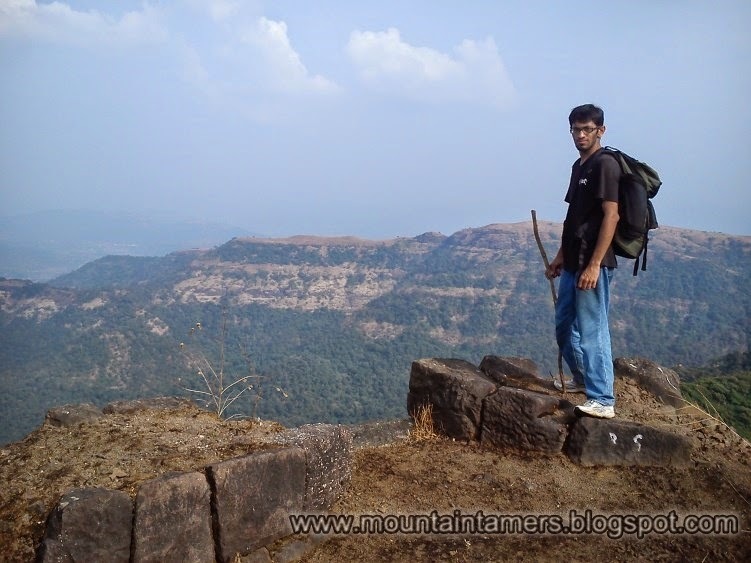 This link will take you to my previous post on Manikgad trek. Hope you enjoyed reading. Note: All the pics used in this post are courtesy of Aaditya Gurav.